Avarice, gluttony, and wrath. The seven sins dangerous enough to be called deadly are now collected under one set of covers, with all errata and some expanded text to make these Sin Monsters as complete and dangerous as they can be. 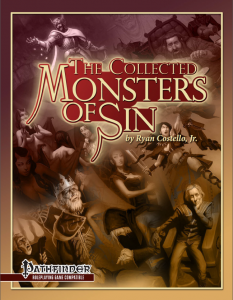 The Monsters of Sin Collection is suitable for multiple levels of play and can be used in any existing setting and campaign, or it can be combined to create a campaign of Sin. Go beyond ordinary monsters, and challenge your champions with threats to mind, body, and spirit! Available now from Kobold Press!